Jimmie Driftwood was a middle-aged Arkansas schoolteacher who, among other things, had been adapting and rewriting old songs, as well as writing original music, about American history, to help his students learn not only about America, but to love its history and the study of history. I'm not sure in which order these things happened, but Driftwood's life got much more interesting when one of his songs attracted enough to lead to a contract with RCA records and result in a cover version of that song by an up-and-coming country singer named Johnny Horton. That song, The Battle of New Orleans, went on to become one of the biggest hits of the late 1950's, hitting number one for six weeks in 1959. As much as I love that record (and all of Horton's tragically few hits), Jimmie Driftwood's records are great on another scale entirely. Accompanying himself with the distinctive sound of his homemade guitar ( along with a few other instruments), and his equally distinctive voice, Driftwood sang with an honesty and directness I'd love to hear on records these days. Today, I've uploaded two of my favorite examples from his many albums (at least seven that I know of, released from 1959-66 or so). The first "Rattlesnake Song" tells a familar folk tale, of the lover saving her beloved from a deadly bite by sucking out the poison. However, in this case, the song is rendered unique by the strange lyrical additions he makes to each verse, throwing in not only the fairly standard nonsense chorus, but throwing rhyming nonsense syllables into the middle of every few words. The other song, Fidi Diddle Um A-Dazey, is easily my favorite Driftwood recording. In less than two minutes (including the time it takes to repeatedly sing the nonsense chorus)he tells the highlights (or lowlights, if you will) of a family's life. And what a story: a randy wife stays eternally pregnant, having 16 children in 12 years, until her constant desires literally kill her husband, at which point she marries a hugely fat man. He, in turn, snores so heavily that the house collapses on all of them, killing the woman and her new man, but sparing the children, who discover enough money (a million dollars!) in the fat man's pockets to sustain them. And it's catchy as hell, fun to sing along to, and one of these days, when I can master that guitar lick while singing, I'm going to sing it live. When he was in his late '80's (in the mid 1990's), it was written that Jimmie Driftwood would still welcome anyone who showed up at his home in Arkansas and visit with them in his home. He died at age 91 in 1998. I wish I'd known of his hospitality a few years earlier, because I'd have love to have met him. For the most part, I really do understand why the songs I've posted here are "obscure". My tastes are hardly in the mainstream, although that's clearly to the mainstream's detriment. But then there are other songs I come across, songs which were perhaps even promoted as possible hits, on real, healthy and even giant labels, but which failed anyway. Case in point, today's next upload, "Barefoot and Pregnant" by Joan Armatrading. Now I know she's never had a hit, but both Phoebe Snow and Tracy Chapman have had major hits which sounded like they could have been right off of a Joan Armatrading album. And not to take away from either of those other singers, both of whom I enjoy, to my ears, Joan is the superior singer and writer. 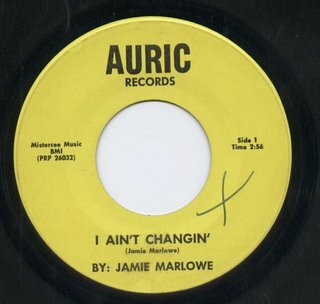 I came across this promo single in a huge batch of records I bought one day about 17 years ago, and on the strength of this song, I've subsequently bought everything Armatrading has released. This song remains my favorite, but I've not been disappointed. I guess with the driving rhythm, pushed forward at times by the acoustic gutiar, or by the percussive nature of certain vocal sections, but mostly by the fantastic drumming. I don't know who's playing the drums, and drums are not something that usually catch my attention. Here, on the other hand, I've replayed sections of the record at times, just to hear one of the fills. As a folkie, I'm really taken with the acoustic guitar interplay on this record as well, and the occasional touches of classic three part harmony. The electric piano is a nice touch, too. But tying it all together, and pushing it from an interesting arrangement into a great all-around record are the masterful lyrics and the equally classic lead vocal. There's an entire story of a relationship here, in just over 3 1/2 minutes. It's probably too fussy and intellectual of a recording to have been a hit, but it came out when records like "Poetry Man" and "Midnight at the Oasis" were hits, so it certainly could have caught on somewhere. But it didn't. What a shame. "I Ain't Changin'" by Jamie Marlowe. Now, here we have the real "difficult listening" file. I don't recall where I got this record, and at some point it went into the "stack of records to listen to when I get a chance". First time I heard it has to have been close to 20 years ago, if not more, but I've never forgotten it. I immediately had both the song title and the name of the "artist" seared into my memory. I hope this was a vanity pressing, because if someone actually released this as a money-making venture on a "real record label", they were probably better off in another buisness. The annoying qualities of Mr. Marlowe's performance are matched by the wretchedness both of the lyrics and of the person those lyrics describe. To whoever drew the big "X" on the record label: it was richly deserved. Ick. On the other hand, as I said, I've never quite forgotten this record either, and now, perhaps, it can infect you, too. Tell me what you think! 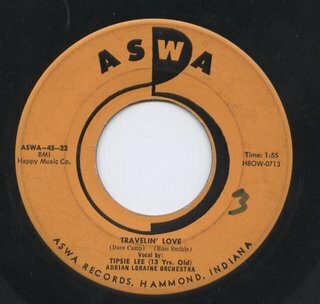 Next up, and not wholly unrelated to Ms. Layne, is Miss Tipsie Lee, who was apparently even younger at the time of this recording than Ms. Layne seems to have been trying to sound: according to the label, Tipsie was "13 years old" when this record was made, and I can certainly believe that. But as much as some others might quickly lump this into the "difficult listening" file, I find that there is something magical happening here. There are points in the song where it feels to me that the train (heard at the beginning and the end of the song) is about to slip right off the track. The energy in Tipsie's lead vocal is infectious, in a way that I rarely hear in the voice of a grown singer, and I'm a big fan of records where you can hear the intake of breath before a big vocal. I found this record at the late, lamented record store "Toad Hall", of Rockford, Illinois, easily the best record store I've ever been in. Three buildings, two of them combined storefronts. However, the owners had taken over the basement and what had once been upstairs apartments, and virtually every space in the buildings, even closets, where stuffed with records, except those places filled with books and magazines. The third building housed nothing but 45's and 78's. Sadly, the owners both died in the past three years, and the store is no more. They Don't Make 'Em Like This No More! Today, I'm uploading a bunch of songs to the Bashleo/Gmail site. First up, a song which serves to remind me that musical releases haven't been much fun for a long time, and that record labels in the '50's and '60's could be expected, on a regular basis, to release something wonderfully insane, and to hold legitimate hopes that at least a few of those releases would be a hit. This (being a hit) wasn't the case for the song I'm describing here - in fact, it may have been a b-side, but it doesn't stop me from wishing that someone, anyone, would start releasing songs and recordings that are this goofy, again. The song in question is "Dum-Dum" by Joy Layne, from 1957. I found this on eBay last month, in an ad which also contained a sound clip of the record. 45 seconds or so of it, and I was hooked. The verse begins: "Love me, you yes; Love you, no me; Love maybe y0u me, too..."
The chorus ends: "Is, Am, or Ain't You Is My Darling?" I think we've all said, thought and/or been asked those things in our lives.